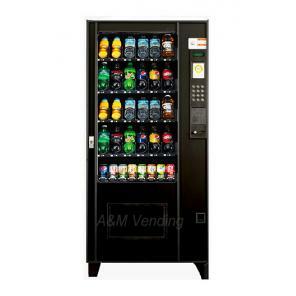 The AMS Bev 30 will vend those hard to vend items small cans, 24Oz bottles , and Energy drinks. Variety is key. Small to medium location. Refurbished AMS Bev 30 Drink Machine- The refurbished AMS Bev 30 Drink machine does those hard jobs that aren’t possible for other common vending machines to perform. For example, vending out those smaller cans, 24oz bottles and energy drinks! As they say variety is the spice of life! Here our Refurbished AMS Bev 30 drink machine gives the same variety to you in the name of new and never experienced before drinks. When we say refurbished, we mean a vending machine that is as good as new. We aren’t doing the lip service only to sell our vending machines but, as our customers are our first and foremost priorities, we make sure when you purchase one of our vending machines, you get only revenues and satisfaction. Our machines are quality look and work like brand new. Vends all cans and bottles up to a 24oz. Smaller machine for a smaller break room. Sensit III Guaranteed Delivery System. Simple to program. Simple to use. Very user friendly. Each Tray Holds 36 items. Telephone tech support available Monday – Friday 8am – 5pm EST. for as long as you own the machine. Comes with rebuilt coin mechanism and validator 90 day parts warranty. New MEI Conlux changer validator package can be purchased for $309.00 and carries a two year warranty. Optional Nayax or USA Technologies credit card reader installed $299.00. Telementary available which lets you see the sales product left in the machine. Tells you when you need to service the machine. Machine warranty parts 90 days. Shipping not included. Dimensions Height: 72” Width: 35” Depth: 35”. Remanufactured by A&M Equipment since 1964.